Who are the DM Refugees? A few months back, my esteemed colleague, Steve Ricci, noted how The Three Stooges were influential in his life. I now happily report that last month, a significant moment in Stooge history was logged. It was in early June that the eighth and last in Columbia’s lovingly digitally remastered box sets of complete, uncensored, and restored Three Stooges films, The Three Stooges Collection, was issued on DVD; these 190 films have never been completely released on DVD before this. Combined with AMC’s recent decision to return Stooges shorts to its regular lineup of classic films, there is – as seems to happen every decade or so – a serious case of Stoogemania going on. It couldn’t have happened at a better time. 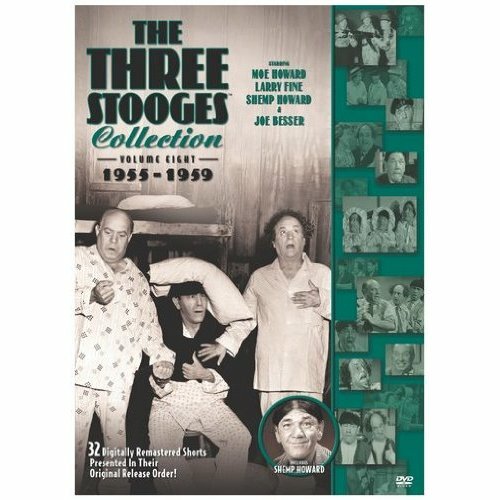 For serious Stooge aficionados, these DVD collections are truly an answered prayer. The Stooge shorts have not only been released in chronological order, but many of these films have never looked so clear, and in some cases, new. The remastering job isn’t without its pitfalls; a couple of packages come with 3D glasses for films released originally in that format, but they still look awful. As well, the overall remastering job is actually so good it reveals everything in pristine black and white – including pies being pulled from ceilings with strings, and what used to look like flying Stooge heads in the opening of Spooks! now show Moe, Shemp, and Larry in black cloaks, running around as if they’d lost their minds (as if that’s anything unusual). It’s actually fun to see the old-time movie magic exposed. So let us sing the praises of these master comedians, who have been underrated since their heyday, but answer me this: Are television stations still showing Charlie Chaplin? The Marx Brothers? Laurel & Hardy? Yet, times come and go, and Stooge shorts are still being shown on national networks, some films being a whopping 76 years old. It is testament to The Three Stooges’ knockabout, zany comedy that it can still be appreciated and loved by audiences after such a passage of time. The reason? The Stooges are damn hilarious, that’s why. A look at the sets: Volume One, which covers 1934 to 1936, begins with the first Stooges short, Woman Haters, a musical number so stilted it’s a wonder the team ever got a second go. But things pick up with the boxing-themed Punch Drunks, and the hospital parody Men In Black, which was actually nominated for an Academy Award. Indeed, “Dr. Howard! Dr. Fine! Dr. Howard!” is quoted to this day, and few Stooge efforts were ever funnier. Volume 2, 1937-1939: The Stooges, Larry Fine and Moe and Curly Howard, find the formula, and it works like gangbusters. Highlights here are Playing The Ponies, where the trio leads a nag called Thunderbolt to racing glory; Healthy, Wealthy, and Dumb, where the three idiots win a radio contest and rent a snazzy hotel room only to discover that after taxes they’re as broke as ever; and Violent Is The Word For Curly, which features the famous “bickey-bye” song that everyone still knows but can’t remember where it came from. Volume 3, 1940-1942: The team is getting more popular, the slapstick is getting more violent thanks to the burgeoning presence of director Jules White, and this just might the Stooges’ prime. The best here include the classic Nazi era satires I’ll Never Heil Again and You Nazty Spy!, All The World’s A Stooge, where Curly delivers one of his most manic and inspired performances impersonating a little kid (and Larry never looked more beautiful), and A Plumbing We Will Go, which might be the high point of the team’s career; it’s the classic “running from the law” Stooge short, complete with wacky pratfalls, high society torn asunder, and the best plumbers who ever plumbed a plum. Volume 4, 1943-1945: Something’s wrong; Curly is slurring his words and the pace is starting to slow down. Around this period, the hard-partying rotund comedian began to fall into ill health – so much so that an impending stroke would not only end his career, but eventually his life as well. However, there’s still a lot of comic gold in this set, including Micro-Phonies, featuring Curly impersonating the golden-voiced Senorita Cucaracha; Dizzy Pilots, where The Wrong Brothers take to the sky; and If A Body Meets A Body, which features some hilarious haunted house gags. However, Curly really starts to fade during this set; White’s They Stooge To Conga is nothing but garishly filmed violence including Moe getting his eyes and ears poked with climbing spikes; and shorts such as Booby Dupes and I Can Hardly Wait, finally, start to miss their mark. Volume 5, 1946-1948: With the film Half-Wits’ Holiday in 1946, exit a very weak and tired Curly, enter Shemp. The floppy-haired comic surely had his critics, most of whom claimed he wasn’t the comic genius Curly was. That’s true, but Shemp brought his own manic energy and pretty much brought the trio back to life for the next couple of years. Included here are his debut with the team, Fight Night, which is nothing but laughs, and Hold That Lion, featuring a cameo by Curly and yet another hysterical two minutes from frequent Stooge regular Dudley Dickerson. Volume 6, 1949-1951: Just as the TV era starts to heat up, the Stooges begin to slow down. Film studios aren’t making many shorts by this point, with Stooge studio Columbia being among the last holdouts. It’s easy to see the budgets going downwards short by short here; rekindled footage is sprouting up regularly. There are finally films that just aren’t funny at all, and they’re becoming disturbingly common; wit is being replaced with violence and repeated gags and phrases. The Tooth Will Out and Baby Sitters Jitters are poorly directed and mirthless, but, thankfully, there are still gems: Hula La La breaks the code and is one of the most original of all the Stooge shorts (a rare one of this period that doesn’t go by the book), and Malice In The Palace ranks with the best Stooges offerings of all time. Try not to crack up when the restaurant-owning Stooges supposedly serve up some “sliced dog and cat” to a pair of Arabian aristocrats. Volume 7, 1952-1954: Bigger trouble in Stoogeland. Even more budget cuts forced the team to remake shorts from both the Curly and Shemp eras, and a lot of them are pretty much a waste of time. For instance, Rip Sew & Stitch is an almost note-for-note remake of the earlier, funnier Sing A Song Of Six Pants with just a couple of scenes re-shot. Few film fans or distributors noticed the cost cutting at the time – most theaters, at this point, were showing fewer and fewer shorts to begin with. There are laughs here with the western spoof Shot In The Frontier and in Shemp trying to install a TV antenna in Goof On The Roof, but things are getting sloppy and sad. The witless Pardon My Backfire is all new, but all unfunny, and Shemp and Moe are starting to look very old. Saddest of all, Shemp’s starting to look very, very tired. Volume 8, 1955-1959: It’s all over but the slapping for the troupe; Shemp (the first 16 shorts here, again mostly remakes) suddenly dies, and is replaced by veteran comic Joe Besser for the trio’s final 16 efforts, after which Columbia shuts down its shorts division forever. Even the supporting players aren’t good; long gone are Stooge legends Duke York, Dickerson, Symona Boniface, Vernon Dent, and Christine McIntyre. Hardy and versatile player Emil Sitka helps, but other roles are filled by actors like the insipid Frank Sully, who delivers astoundingly awful performances. During the Besser shorts, Moe and Larry seem to be trying too hard, gesturing and overacting like madmen, probably realizing their new fat foil wasn’t up to the task. Besser, to his credit, was much more likable and funny working with Joey Bishop and Abbott & Costello; he simply seems out of place here. Still, two horse-themed shorts bring a few laughs, but Quiz Whizz, Outer Space Jitters, and the final Stooge short, Sappy Bullfighters, are as bad as any movies ever released by a major motion picture studio. As a Stooge fan that wanted to complete his collection, I purchased this set, but of the eight, this is the hardest to recommend. Perhaps it’s nostalgia for my youth, waking up to watch a single Popeye cartoon and a Stooge short before heading off to school. Maybe it’s longing for a simpler time. Maybe, secretly, there’s a desire to bop my employer over the head with a lead pipe just to hear the beautiful steely “KONK!” sound. Whatever the reason, these lovingly remastered, low-priced collections are perfect for anyone who ever loved The Three Stooges. And how I do dearly love them. I believe that after all these years, I’ve figured out the reasons why. Moe, Curly, and Shemp Howard, as well as Larry Fine, Joe Besser, and Joe DeRita (the last Curly replacement), never became millionaires from acting as most of today’s film stars do. However, even as an old man before his death in 1975, Moe always was trying to find ways to keep the Stooges going. He reportedly was going to team with DeRita and Sitka even after Larry could no longer go on. One gets the feeling that if Moe were alive today at 113 years old, he’d still be a member of The Three Stooges. From all accounts, Moe Howard, the brains of the group in real life as well as on-screen, loved what he did, every moment, every poke, every pie fight, and every slap. A magazine article printed just before Moe’s death reported that the elderly comedian saw a child in a store, and at that moment, he became a Stooge again, delighting the kid with impromptu, crazy antics. Moe Howard was born to be a Stooge. If someone loves what he does that much, he’s got soul and heart, and those are attributes too few of today’s entertainers possess. But I think it all really boils down to this: When a Stooges scene shifts to a hotel, and to let you know, a sign is shown with the name “Hotel Costa Plente,” I still laugh like a hyena. Yeah, those corny old men still crack me up. May their heirs be richly blessed, every one of them. Dare I say, few people on this earth have given this writer more pure joy than The Three Stooges. May they poke, slap, gouge, and woo-woo-woo till the end of time. And if you don’t get to the store to pick up these beautiful DVD collections, well, you’re just a knucklehead. Wow. I didn’t even know they made new Stooge DVD sets. See? Now I have to go to Best Buy and spend all my money. Why, you!!!!!! Shemp, Curly, and Moe Howard is of Lithuanian-Jewish origin, while Larry Fine is of Russian-Jewish origin, while Joe Besser is of Polish-Jewish, Russian-Jewish, or Belarusian-Jewish origin, while Joe DeRita is of English and Portuguese origin, while Emil Sitka is of Carpatho-Rusyn origin. After 24 years, without warning after Diana Darrin and Bek Nelson is the one of the last women to appear and Three Stooges from the Shorts Department from Columbia were gone for good. Christine McIntyre, in Of Cash and Hash, after that, she never appeared on film again. The very first actor to speak in the very first short was the direct descendant of the American Revolution, Bud Jamison. His sister married to Sam Cartmell. Jamison is no longer living. Emil Sitka did work with the Stooges on Columbia shorts until the very end. So does Joe Palma. Palma is of Sicilian origin due to Provezano. God rest their souls. As long as The Farrellys are filming their new Three Stooges comedy with Mel Gibson planning to star as Shemp Howard, Sony Home Entertainment can finally newly restored and remastered the Three Stooges movies with Curly, Moe, Larry and Curly-Joe, as well as the Shemp Howard, Joe Besser and Curly-Joe DeRita solo shorts too sometime in 2012 soon.